Polish painter and illuminator. He is documented from 1506 when he is named "pictor de Mogila", painter of the Cistercian convent in Mogila, Cracow. In 1511 was allowed to live outside the convent and was hired at the court of Chancellor of Great Crown, Krzysztof Szydlowiecki, where he was a chaplain from 1510 to 1530. During this period he run a workshop in Cracow, where many assistants were hired. From the mid-1520s he worked for Szydlowiecki and Bishop Piotr Tomicki. After the bishop s death he returned to the convent in Mogila, where he died in 1541. Samostrzelnik s miniatures are typically very bright, full of colour contrasts. Decorative aspects of his miniatures are based on connection between all parts of the picture, figurative scene and ornaments. Figures are shown in very naturalistic, almost comical way, usually clothed in modern fashion style. From 1520 onwards his works are inspired by German prints, especially by Altdorfer and Drer. After his visit in Vienna, in the capacity of Szydlowiecki s chaplain, he was also influenced by the Austrian school. Dutch and Italian manners are noticeable mostly in ornamental parts. In later works he turned back to Polish tradition, to the Miniaturists School of Cracow. Initials S. C. (Stanislaus Claratumbensis) are signature of the workshop, not only of himself. His main works are illuminations for prayer books: Book of Prayers of Zygmunt I the Old, (1524, London, British Library); Book of Prayers of Bona Sforza (1527, Oxford, Bodleian Library); Book of Prayers of Krzysztof Szydlowiecki (1527, Archivio Storico Civico and Biblioteca Ambrosiana, Milan); Book of Prayers of Wojciech Gasztold (1528, Munich, Bayerisches Nationalmuseum). 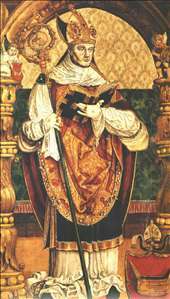 He also painted frescoes in the church in Mogila, and the portrait of Bishop Piotr Tomicki in the Franciscan church in Cracow is attributed to him. This portrait is his only surviving panel painting. See more details about "Portrait of Bishop Piotr Tomicki"